SG800 is a multi-functional RC quadcopter with outstanding appearance and slick design. The debut makes a breakthrough of imagination margin. It&apos;s equipped with a 720P wide-angle camera with WIFI FPV transmission which provides superb real-time FPV experience, and capture every unforgettable second, ready to give a full shot to reinvent your vision from a new prospective. 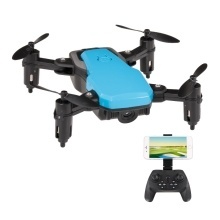 Comes with lots of intelligent functions providing a lot of flying fun, such as 3D flip, gesture photo/video, headless mode, altitude hold mode, high/low speed, one-key return function, one key to start, one key to land, emergency stop. Great choice for drone hobbyist.